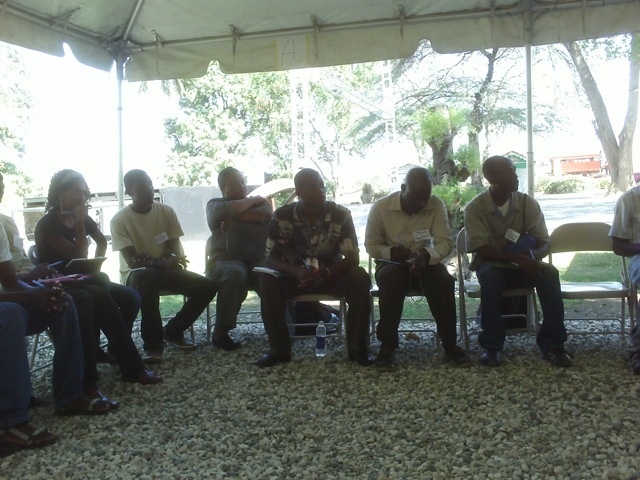 Organizing for Change – Haiti Response Coalition | HURAH! 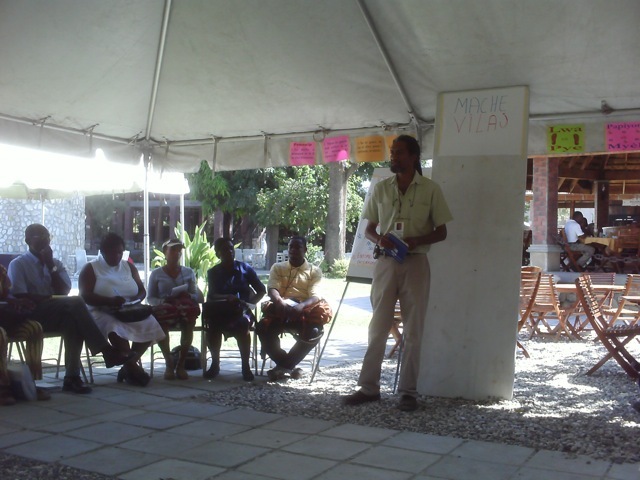 Jean Luc “Djalòki” Dessables co-founded the Haiti Response Coalition (HRC) to bring Haitian grassroots agencies into the decision-making processes of foreign non-governmental organizations (NGOs). The challenge is to connect traditional NGOs–from the Red Cross to UNICEF to other international agencies–with the priorities that Haitians set for themselves to enable institutional change – to help Haitians help themselves. 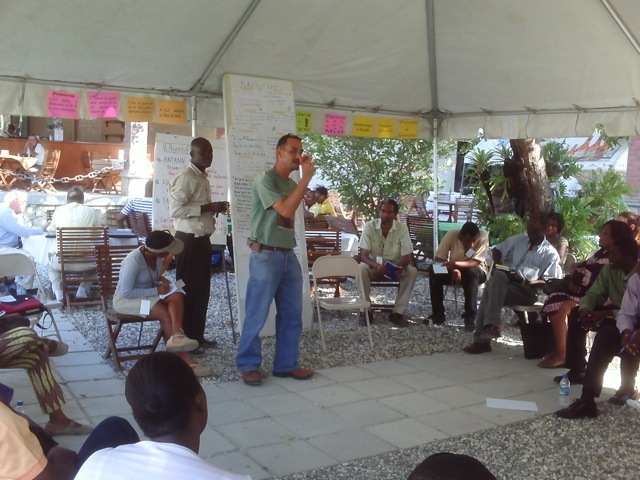 HRC is an attempt to give local Haitian agencies a place at the table by uniting grassroots community groups as they prioritize, organize, and strategize for the future. The national HRC meeting lasted two exhausting days. All the proceedings will be posted on the HRC website. HURAH provided English translation services for the HRC‘s press release. The attendance the first day of the retreat was around 80 and grew to over 100 the second day. The format used for the meeting was “Open Space” – a disciplined meeting methodology in wide use internationally. The idea is to provide a work space – through groupings of like-minded folks driven by the same passion – for people to move together. 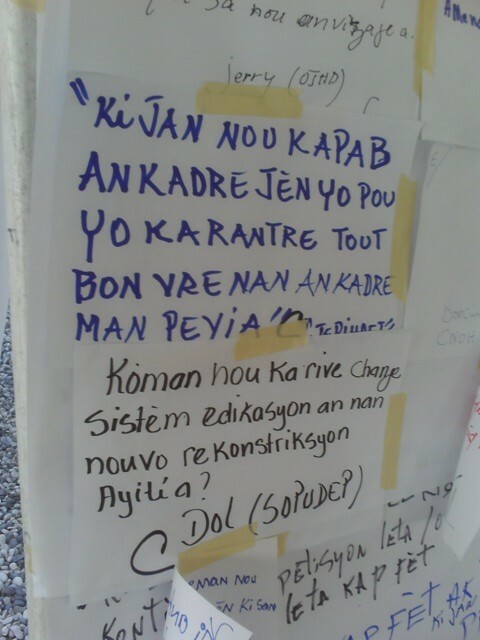 Participants were encouraged to write down a question or goal they are passionate about – given the general theme of rebuilding Haiti. Then these papers were posted and people “shopped” around to find like-minded individuals. If a proposal attracted two 0r three people, it became a sub-group. These groups then met and hammered out full proposals, and the members of the group become accountable for the actions they defined. After each small group met a representative presented the small group’s recommendations. The plenary group had the right to accept or reject the requests. Read more about the HRC here.